Casual references to annihilation pop up every day in American life. That makes it harder to communicate the danger posed by Donald Trump’s appointment of John Bolton as National Security Advisor. Bolton has poor judgement, a mean spirit, and an intellect that’s weaker than he thinks. He spreads ethnic hatred and argues for sending others to fight and die. This weekend, young people around the country stood up against gun violence in their schools. Bolton’s appointment tells us that senseless violence may soon dominate our foreign policy, too, even more than it already does. Bolton seems to pursue Machiavelli’s dictum that “it is much safer to be feared than loved.” But it’s not safer. As we’ve learned from Bolton’s past mistakes, foolish wars bring fresh dangers as well as needless tragedies. Machiavelli also said, “The first method for estimating the intelligence of a ruler is to look at the men he has around him.” This appointment confirms what many of us already thought about Trump’s intelligence. But Bolton’s no Trumpian deviation from social or political norms. He’s a political insider, beloved by think-tankers and mainstream media outlets alike. They’re already clucking their tongues in disapproval at Bolton’s appointment, but it’s all for show. Could North Korea really launch a nuclear strike on the United States? Apparently, it’s possible. But most of the people sending those notes are probably safe. The Korean Peninsula is the likeliest target, with the Middle East second. Kim Jong-un would need some luck to reach the West Coast of the United States, although that will be of scant comfort to Seattle or Portland residents if it does come to pass. But then, Bolton is the ambassador of chaos. He was an enthusiastic backer of both the Iraq invasion and the overthrow of Muammar Gaddafi, two moves that destabilized the entire Middle East and led to the formation of ISIS. 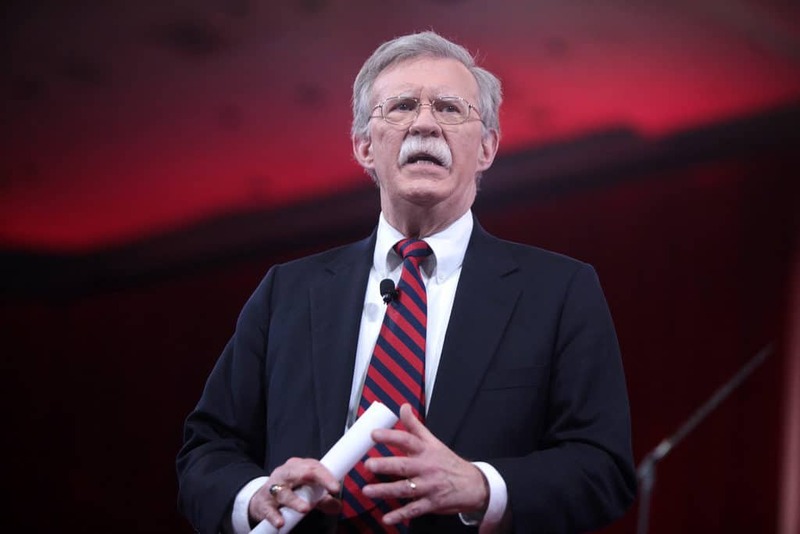 Bolton has been associated with Mujahidin e-Khalq (MeK), an Iranian terror-linked insurgent group that has reportedly been very generous with its friends in Washington. He is also, incontestably, a bigot. Bolton is closely associated with fellow Islamophobes Pamela Geller, who once asserted that Barack Obama is “the love child” of Malcolm X and “was involved with a crack whore,” and the alt-right white supremacist Richard Spencer. Charming. Bolton is the chair of a fake-news source, the Gatestone Institute, which publishes false, hate-filled screeds against Muslims. “The fact-checking website Snopes has found multiple false viral stories originating with Gatestone,” writes The Intercept’s Lee Fang. Bolton’s also tied to another news hook. He had a working relationship with Cambridge Analytica. “The Bolton PAC was obsessed with how America was becoming limp wristed and spineless and it wanted research and messaging for national security issues,” said former Cambridge Analytica team member Christopher Wylie. That sounds like a good reason to campaign against the war, if only to ensure that nobody else died needlessly. But Bolton was only looking out for himself. He wasn’t concerned about the deaths of others. “Mr. Bolton has a reckless approach to advancing the safety and security of Americans – far outside any political party,” is how Sen. Robert Menendez (D-NJ) responded to the announcement of Bolton’s appointment by Trump in a statement. Far outside any political party? Sadly, no. And Bolton has sometimes found allies on both sides of the aisle. A number of congressional Democrats, including Senate Minority Leader Chuck Schumer, joined Bolton and other Republicans in opposing Obama’s treaty with Iran. Bolton is a Senior Fellow at the American Enterprise Institute. The Wall Street Journal quickly threw its support behind Bolton’s appointment. His op-eds have been published in a number of major newspapers and magazines. Bolton was a key member of the Bush administration, beginning with his role in thwarting democracy during the 2000 election – remember, “I’m from the Bush-Cheney team and I’m here to stop the count”? That desire to suppress inconvenient evidence seems to have stayed with Bolton. He had the head of the UN’s chemical weapons agency fired In the run-up to the invasion of Iraq, before the agency’s inspectors could thwart the drive to war by proving Saddam didn’t have weapons of mass destruction. The fifteenth anniversary of that disastrous invasion coincided with Trump’s announcement of Bolton’s appointment. Bolton’s botched predictions for that war led to a human tragedy that’s still not over. He couldn’t have been more wrong. But being wrong about Iraq isn’t a disqualifier for Beltway insiders. They all were. John Bolton isn’t dangerous because he stands outside the national security establishment, or because he lacks Washington respectability. He’s dangerous because he’s an insider. He can make Trump’s wild-eyed notions just respectable enough to be translated into action. The establishment has already shown its willingness to absorb Bolton, no matter how is extreme his ideas. (Bolton) was hostile to the idea of international law, having once declared, ‘It is a big mistake for us to grant any validity to international law even when it may seem in our short-term interest to do so—because over the long term, the goal of those who think that international law really means anything are those who want to constrain the United States. As a writer and speaker, Bolton is a capable of giving his extreme ideas a semi-legitimate gloss that passes muster in certain quarters. This op-ed is a case in point: Bolton argues for all-out war on Iran, which is considerably larger than Iraq, in language that sounds almost reasonable. Bolton also employs well-worn debater’s tricks, with phrases that force his opponents to prove a negative (as in, “there is no evidence Iran’s intention to obtain deliverable nuclear weapons has wavered). Obama is no Harry Truman… At worst, the real precedent may be Ethelred the Unready, the turn-of the-first-millennium Anglo-Saxon king whose reputation for indecisiveness and his unsuccessful paying of Danegeld — literally, ‘Danish tax’ — to buy off Viking raiders made him history’s paradigmatic weak leader. With John Bolton as National Security Advisor, a badly-advised “Donald the Unready” is more likely than ever to cause tragedy and death, on a scale we can’t yet imagine.